Ed. Donna J. Campbell and Simon Lloyd. L.M. Hall Printing Ltd., Lindsay: Ontario, 2010. To mark the 100th anniversary of the publication of L.M. 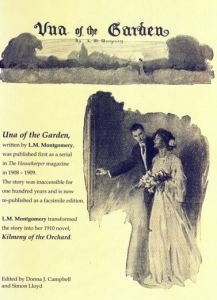 Montgomery’s third novel, Kilmeny of the Orchard, the LMMI released a facsimile edition of "Una of the Garden", the story that eventually inspired the novel. “Una of the Garden” was first published in serial format in The Housekeeper magazine in 1908–1909, but the scarcity of back issues of this magazine made Montgomery’s story inaccessible, until now. The facsimile edition booklet, reproduced from the holdings of the Ryrie-Campbell Collection at LMMI, offers a fascinating opportunity to experience Montgomery’s work within the context of the original magazine publication, including illustrations and advertisements. The booklet also provides insight about the transformation from the story to the novel. "Una of the Garden" is edited by Donna J. Campbell and Simon Lloyd, with an introduction by Kate Macdonald Butler. Proceeds from the sale of this publication will go directly to support the work of the L.M. Montgomery Institute.